Eight years ago, Sainsbury’s announced plans to stock only higher welfare own label fresh chicken. They even took out newspaper adverts to shout about their animal welfare credentials. But, today, less than 20% of the chicken they sell is higher welfare. And now they’ve decided they’re not even going to try to stick to their word. Please, sign the open letter to show Sainsbury’s what you think of their broken promise. For more information about Sainsbury’s broken promise, and what it means for chickens, click here. To download copies of the ‘Shamesbury’s apology’ to print or share, click here. 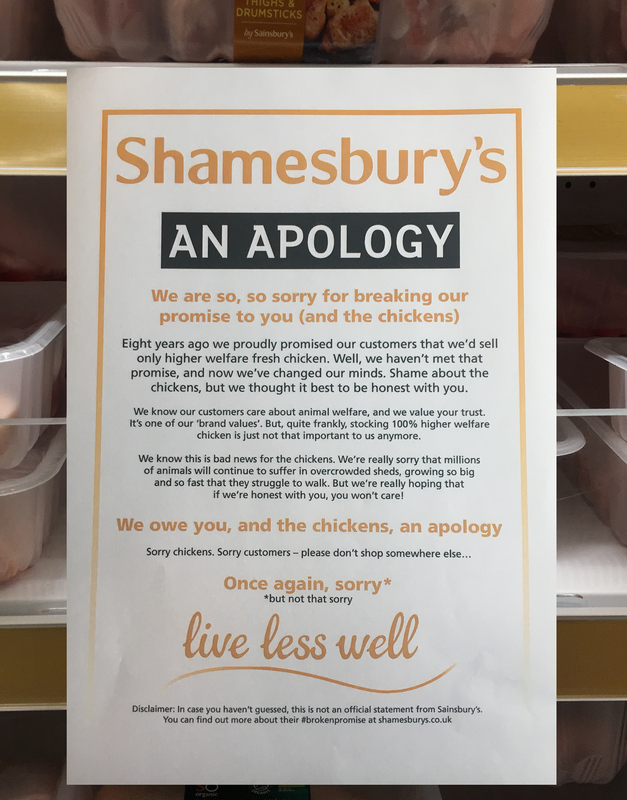 We, the undersigned, are appalled that Sainsbury’s have broken their promise to stock only higher welfare own brand fresh chicken. By going back on their word, Sainsbury’s are consigning millions of chickens every year to life in overcrowded sheds. Due to selective breeding, these animals will grow so big, so fast that they may struggle to walk, can develop serious heart conditions, and will be unable to behave like chickens should. Sainsbury’s, your ambition is to be the UK’s most trusted retailer. Your broken promise, to customers and to the chickens, shows you are unworthy of our trust.